Kevin Miller, the owner, was an independent insurance agent specializing in life and health insurance, beginning in 2000. After working for a couple of large companies, he decided to strike out on his own and started Kevin Miller Insurance Services in 2001. 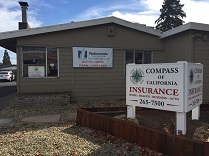 After one year and lots of hard work, he was able to take over an existing practice, renaming it Compass of California Insurance Services in 2002. Compass was at the Lincoln Avenue complex until 2011, when we moved to the Riverpark Shopping Center. As the Riverpark will be undergoing extensive renovations beginning in November (not to mention the fact that our building will be demolished to make way for a drive-through Rite Aitd), we will make one final move to our new office across the street from the Queen of the Valley Medical Offices on Trancas Street here in Napa at that same time.